"This is my brother-in-law's favorite recipe passed down from grandmother to daughter in my wife's family for years." Beat shortening, butter, and white sugar together in a bowl using an electric mixer until smooth and creamy; add eggs and vanilla extract and beat until smooth. Sift flour and salt into creamed butter mixture and stir just until dough is combined; fold in pecans. Shape dough into 1-inch balls and arrange on a baking sheet. Bake in the preheated oven until lightly browned, about 20 minutes. Cool cookies slightly and roll in confectioners' sugar. Cool cookies completely and roll again in confectioners' sugar. You may substitute shortening for the butter. 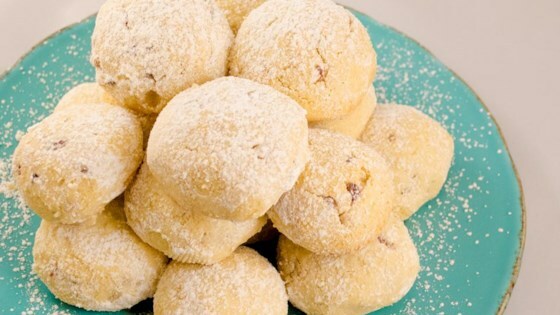 This recipe makes excellent snowball cookies, exactly as written. Loved by all who tried them and sure to become a regular in our Christmas cookie rotation. Made as directed with pecans. Bland tasting. Would recommend using almond extract vs. vanilla. Recipe made 48 cookies. Similar recipe using cream cheese better.